An iconic saddler’s shop houses a heritage Nevada museum that honors the first cowboys. G.S. Garcia (shown second from the left, in a 1913 rodeo photo) originally built his G.S. 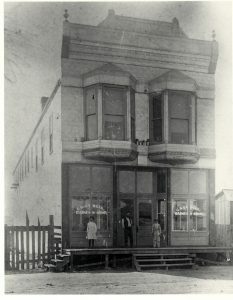 Garcia Harness Shop on Silver Street in Elko, Nevada, in 1907, but in 1913, he moved the building to Commercial Street (pictured below). His shop now pays tribute to Garcia’s legacy and to cowboy history as the Cowboy Arts & Gear Museum. First, thanks go to the Franciscan priests who established 21 missions along the California coast starting in 1769, bringing with them the first ranches of the American West—and the vaqueros who were our first cowboys. Second, thanks go to the power company—NV Energy—which not only donated a historic saddle shop for a new museum in Elko, Nevada, but then restored the 1907 building on its own dime. And finally, thanks go to Paula Bear Wright’s family and Jan Petersen, for realizing their community’s “dream come true” by opening the Cowboy Arts & Gear Museum last February to showcase vaquero-buckaroo-cowboy history. In fact, if Elko were a jigsaw puzzle, Petersen’s museum is the missing piece. Across the street from her downtown museum in the historic G.S. Garcia Harness Shop is the Western Folklife Center that celebrates contemporary cowboy lifestyles and is home to the annual National Cowboy Poetry Gathering. Elko also is home to the Northeastern Nevada Museum and the California Trail Interpretive Center. Petersen is the perfect director for a history museum. Her Pearce family has lived in the Elko area since 1869—predating even the historic saddle shop where she now spends her Tuesdays through Saturdays from 10 a.m. to 5 p.m. Even a longer legacy goes to her husband’s Petersen family, who homesteaded a ranch here in 1864. Both families were well established when G.S. Garcia and wife Saturnina arrived in Elko in 1894 with his saddle-making supplies. His work was instantly popular with local cowboys. Within three years, he produced a mail-order catalog that expanded his customer base across the West. Garcia became famous for creating the only saddle in history to win two gold medals (at the 1904 World’s Fair in St. Louis, Missouri, and at the 1905 Lewis and Clark Centennial Exposition in Portland, Oregon). His bits, spurs and saddles remain highly collectible today. In 1907, he moved into the building that now houses the museum. “Cowboys were willing to pay two year’s wages and to wait their turn on a two-year waiting list to purchase and own one of Garcia’s saddles,” the museum website states. The museum has three original G.S. Garcia display cases, looking just as they did the day the store opened 111 years ago. On display are 116 spade bits and 35 bridles, as well as spurs, photos and family ranching histories, Petersen says. The Wright family, who owns the J.M. Capriola Co. opened by G.S. Garcia’s apprentice, helped interpret this history. Petersen’s future plans for the museum include offering leather stamping workshops, silver engraving demonstrations and rawhide braiding classes, and building a research library to help tell the story of the first cowboys. “We’re having a great time sharing all this,” she says.